Here's part 2 in the series explaining our "full stack" at a high level. If you missed part 1, make sure to give it a read first. If you prefer, you can read the long-form post with all the content in one. Again, feel free to call me on any technicalities or suggest changes/additions in the comments! View/download a full-size version here to follow along. The development server is a web server that handles the next stage of the deployment process on the way to the production environment. As developers are working on a project in Github, the site starts to come together to the point that it's ready to be hosted for internal review, and here's where the dev server comes into play. The dev server has much of the same application stack/development environment that local envinonment does, and the more closely configured the dev server is to the production server software-wise, the better. Ours happens to be a dedicated machine in our server room. Unlike a local environment, the dev server is actually serving websites to a network (which can be controlled to be internal only or accessible via the Internet) so that work in progress can be viewed by means other than looking over a developer's shoulder. When multiple developers are working on a project, the dev server is the best place to deploy their combined code for a first look. Encourage developers to update dev regularly; showing work early and often is healthy! Here's where more people get involved. The expectation of the website on the dev server is that it displays active work in progress and therefore is at times broken and/or buggy. When a website is early in development, parts may be complete and others haven't even been touched yet. When a website is live on the Internet but also in continued development, the dev server's in-progress development may actually be less functional than the live website due to regression. While the dev server's main purpose is to show work in progress, it also serves as initial QA and testing ground to allow for behavior-driven development. Our QA team can do automated testing with Behat, hands-on exploratory testing, or any of the other multitude of types of software testing that exist. The staging server is yet another web server in the deployment process prior to the production server. 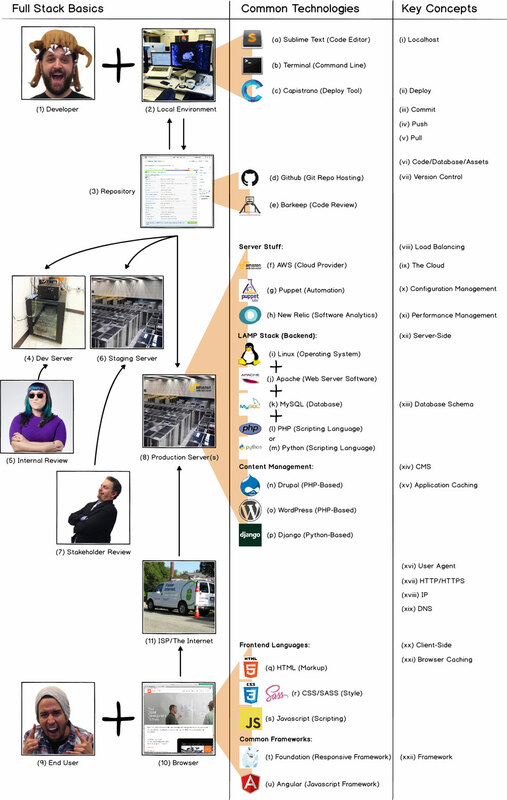 Any number of servers can exist between the local environment and the production server (see chart), but the two we regularly employ are dev and staging. The more closely configured the staging server is to the production server software AND hardware-wise, the better. This allows a higher level of confidence that no issues will show up in production that can't also be reproduced on staging, and initial performance testing/load testing can be completed to ensure software performance assuming the hardware somewhat resembles production. The process of deploying to the staging server is essentially the same as the dev server deployment, just with a different target environment. Staging is usually the first environment that external project stakeholders review, as the deployments made to staging are less frequent and the work is more polished than dev. Clients and development partners test and accept our work on the staging server prior to our deployment to production. For a new site that is not yet live in a production environment, initial content entry and site configuration often occurs in staging as well so that the site is fully ready to be seen by the world when it goes live on production. At last, we've arrived at the production server! Or servers! Depending on the the number of visitors the website receives and the amount of data that needs to be transmitted, multiple servers with (viii) load balancing may be necessary in order to handle the website traffic. This (and dev/staging servers for that matter) could be either a virtual server (essentially only part a of a physical machine's resources running a virtualized copy of the full stack from operating system to website code) or a dedicated server (a physical server solely used for hosting a single website). It could be an old desktop computer running server software in the office closet or it could be a server in (ix) the cloud. Kudos, by the way, to whoever came up with the buzzwordy "cloud" label applied to what is essentially nothing more than one or more networked data centers. The cloud is much less some ethereal place where data lives, and much more huge infrastructure intended to provide high availability and performance for web hosting. Our go-to these days for cloud services (as it is for many developers) is (f) Amazon Web Services (AWS), which has the most tools for server management and the biggest cloud network available. We often run (g) Puppet on our servers to allow for automation of server-level (x) configuration management, saving our Managed Cloud team huge amounts of time and manual effort. Further, (h) New Relic and similar analytics tools allow us to review and (xi) manage performance of software and hardware on our servers, aiding troubleshooting performance problems. DevOps, or the intersection of development and IT operations, is primarily concerned with this server configuration and software management. (i) Linux is the operating system that runs on our servers. It's a Unix-like operating system, so applications that run on our servers usually also run on our local Mac environments. Beyond the user experience of OS X, that's a big part of the reason we develop on Macs. (j) Apache is the web server software running that allows users to connect to the server and make requests using hypertext transfer protocol (HTTP). Yep, that's what that http:// or https:// start to a URL address is all about. (k) MySQL is the software used to manage the relational databases of dynamic websites. It is managed via command line, but there are a number of GUI interfaces (phpMyAdmin being a common one) that allow for database administration as well. When it comes to content management systems (covered below), they are programmed to interact directly with the database without human assistance. (l) PHP and (m) Python are two of the primary server-side languages we use for development. Note that this is one area where websites that use scripting languages differ from mobile applications which are compiled to be downloaded from an app store and run locally on the mobile device. Instead, these scripting languages are interpreted from one language into something else, in what's known as preprocessing. Within the relational database, each of the three types of content has a table. Within each table the fields make up the individual columns, and the rows are populated by the numerous individual pieces of content. Because of all the unique content and different requests for specific content from users causing extra load on the server, most CMS offer (xv) application-level caching to build cached versions of commonly requested pages from site visitors. Wondering why you're not seeing the changes you just made to your website? Try clearing the application caches! Metal Toad works with a number of different content management offerings, most notably (n) Drupal (a PHP-based enterprise-ready CMS), (o) WordPress (a PHP-based CMS used by a huge number of websites), and (p) django (our Python go-to for databased managed projects that require a content framework rather than a full-blown CMS).